Work Hard. Respect All. Perry Pride. 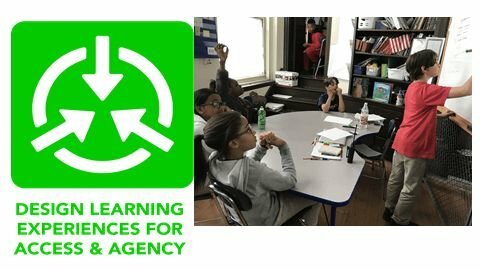 Located on the South Boston waterfront, the Perry School's instructional focus is to provide opportunities for students to explain their thinking with evidence-based oral and written responses. This focus will allow our students to develop the critical thinking skills needed for high school and college. We consistently communicate our school values of "Work Hard. Respect All. Perry Pride." every day to our students, since we truly believe that hard work and respect for all are essential for educational and life success. Our small size allows us to develop meaningful relationships with students so that we can individualize our instructional strategies and students’ social and emotional development. All Perry K-8 School staff work collaboratively to engage our students in challenging and high interest learning tasks. 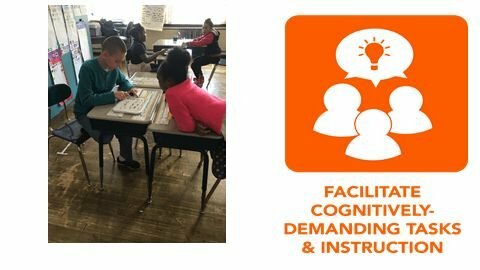 We provide intervention and supports to students in math and reading through our special education teachers and intervention specialists to ensure that all students are maximizing their academic growth. Students are positively reinforced every day with “Shark Bites,” "Shark Cents" and “Shark Shout Outs." The Perry School holds monthly assemblies where students are recognized for academic achievement, academic improvement and positive citizenship. The Perry School has a strong focus on STEAM (science, technology, engineering, art, mathematics). Student are offered STEAM programs, art, physical education, and music programs every week. Perry School students go on field trips to the Science Museum, the State House, the New England Aquarium, Boston Public Market, start-up engineering companies, Paul Revere’s House, theatrical performances, apple picking, and many other places. The Perry School is supported by an active Parent Council and community partnerships. BPS School Buses will be providing transportation to and from BPS School Showcase from the following locations. Parking will be available at pick-up/drop-off locations, feel free to drive to the bus stops! The School Site Council (SSC) is the central decision making body of the school chaired by the Principal. The Perry's SSC formally consists of 4 elected parents who serve one year terms, together with 2 teacher representatives who serve two year terms. All meetings are open to the public. The SSC works closely with the Friends of the Perry. Please see the Boston Public Schools School Site Council Manual for full details. 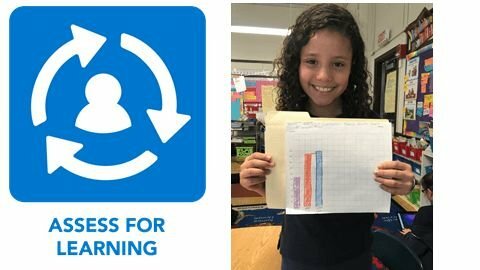 In order to provide students with an exceptional curriculum and the best possible resources, the Perry has partnered with a number of reputable organizations which share its philosophy of providing opportunities for ALL students (every child, every day) to productively struggle with learning while engaging in oral and written tasks. The Perry K-8 School is a community working together to prepare our students for successful futures. We develop strong relationships with families and students to provide the best education for every child, every day. Our focus is to academically and socially advance our students through innovative experiences designed to positively promote the learning of the whole child. All Perry School students and staff work towards achieving an instructional focus that states, “we will provide opportunities for ALL students (every child, every day) to productively struggle with learning while engaging in oral and written tasks.” We embrace what it means to have “sweaty brains” because we know that when students’ brains and thinking are challenged, true connections are made! We utilize our time intentionally to enhance our thematic curriculum. This includes more culturally and currently relevant texts to build an inclusive and supportive learning environment. All grades attend science classes with a STEAM (science, technology, engineering, arts and mathematics) focus, such as general science, computers, engineering, robotics, dance, and art. All classes have access to laptops, IPad, and projectors. Robotics programs start in K1. In addition, there is an after-school STEM club for Grades 6-8. 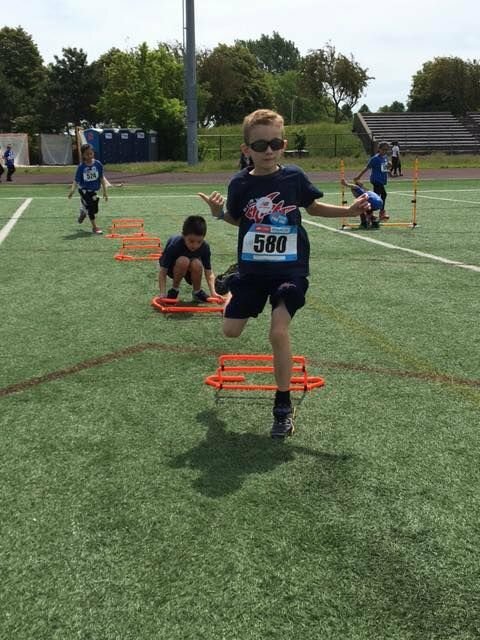 The Perry School provides physical education to its students, believing there is a direct correlation between physical health and a student’s ability to learn. All students also have recess every day, weather permitting. 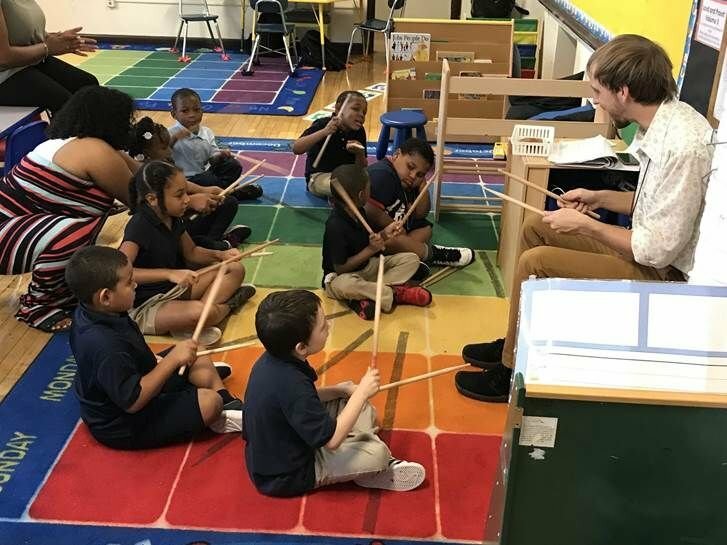 The music program (voice and instruments) is offered through the Perry School's collaboration with Community Music Center of Boston. At the end of each semester, students participate in a musical performance for the Perry Community. 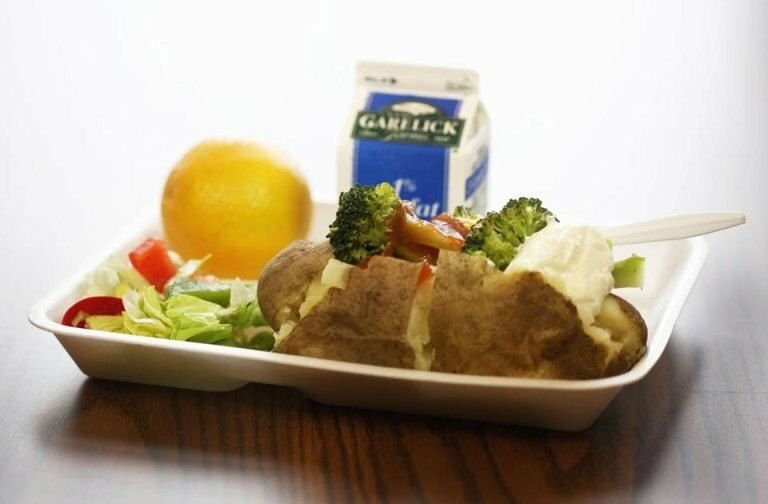 ALL students in Boston Public Schools will have the opportunity to enjoy breakfast and lunch for free every day at their school. The Perry K-8 School has an on-site before-school program coordinated by Perry School staff. The before-school program is offered Monday-Friday from 7:30 AM - 9:15 AM for all K1-5 students. To support the success and supervision of this program, families are given a monthly choice of 2, 3, 4, or 5 days/week rates. The Perry K-8 School also offers "Shark Squad" a fitness program on Tuesday and Thursday mornings before school. The program is held both in the fall and spring. Parents have the option for full year participation or just one session. Tuition waivers may be available upon request. The Perry K-8 School has an on-site after-school program for students in grades K1-5. The program is available Monday-Thursday from 4:00-5:45 PM and also has a monthly rate depending on the days/week selected by families. 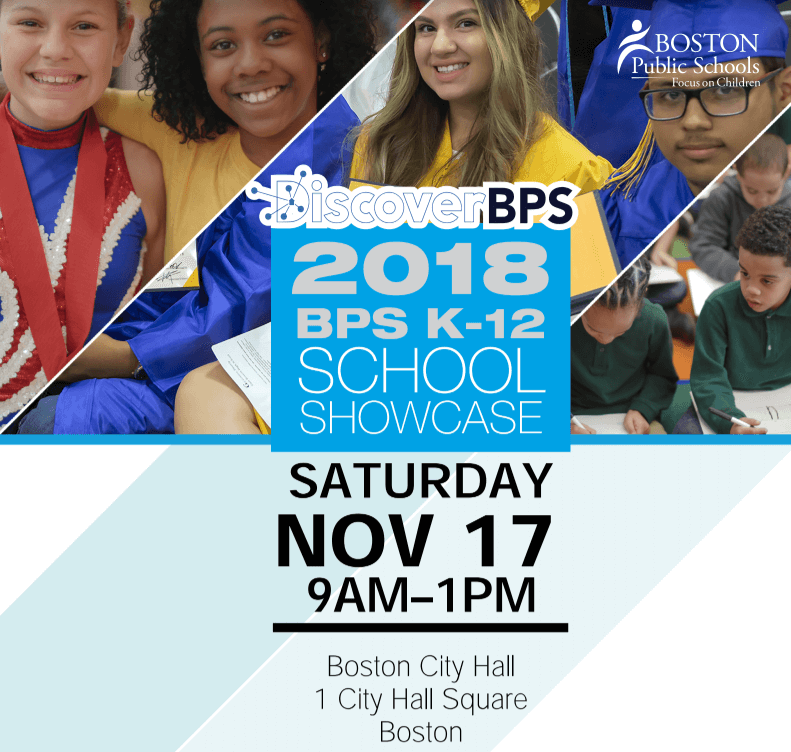 Students in grades 6-8 are invited to attend a variety of off-site programs with the South Boston Neighborhood House, South Boston Boys & Girls Club, the Curley Community Center, Tynan Community Center and the Paraclete Center. Perry students are expected to wear navy blue tops and khaki/navy blue bottom. *If families wish to purchase uniforms with the Perry Sharks logos, the Perry School is happy to announce a partnership with Land's End (School Outfitters) for student uniforms as well as adult selections for staff and parents. Sign up to receive sales and discounts! 2. Black Friday Special – 50% off Home & Totes (which make a terrific holiday gift for staff or Parent Volunteers) and 40% Site wide. The promotion code will be sent out directly. Looking for the safest walking route to the Perry School? 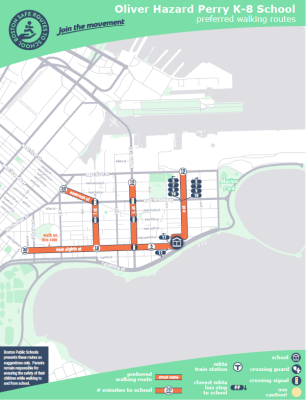 ​Check out the Suggested Walking-Route Map, provided by the BPS Health and Wellness Department as part of the Safe Routes to School Boston program. The map was created under the direction of the BPS Transportation Department and Toole Design, Inc., an engineering firm that has been working with BPS over the past few years to evaluate the infrastructure surrounding schools across the city. As part of their work, they evaluated the neighborhood around the school. Not only did the engineers consider basic infrastructure such as cross walks and signals, they evaluated crash data in the area, where crossing guards may be located, and other factors such as the convenience of travel for students living in the area. This map provides estimated travel times from various locations, and includes options for mass transport, including bus routes and MBTA locations. The purpose of the map is to help families in our school community who walk, to encourage them to walk together, and to do so safely. It may also prove useful for identifying potential locations where parents/guardians might park the car and walk a shorter distance to school. 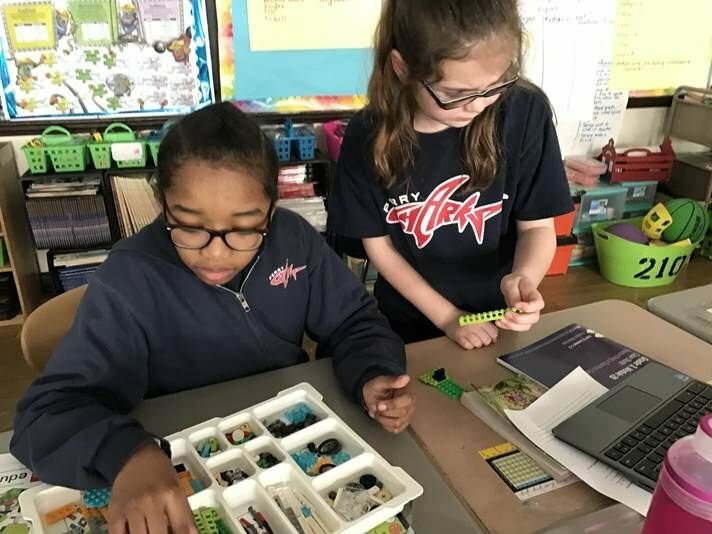 One of the prevalent arguments for increasing STEM learning in Massachusetts schools is to ensure that we have the educated workforce needed to compete in an increasingly high-tech 21st-century economy. But another advantage to STEM learning is how it helps narrow the opportunity gap that many students of color face. As the principal of the K-8 Perry School in Boston, I am proud that we are bringing the power of STEM to our students. 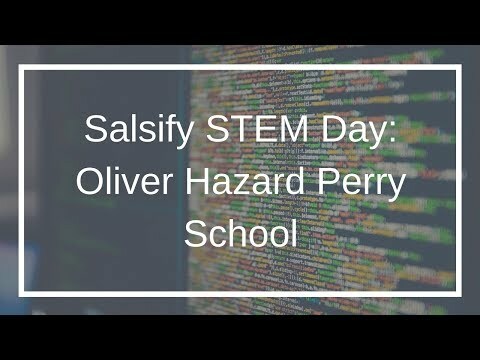 The Perry first ran STEM Week in 2016 with the help of i2 Learning, a nonprofit that partners with schools to transform their classrooms into STEM learning labs. They supply teacher training, curriculum, and materials at no cost. For me that is a game-changing idea. Resources are always a challenge and this allows every middle school to participate. I love the equity of that model and the opportunity it has offered our students. That first year was a huge success, and it acted as a catalyst for the school to launch similar curriculums and develop new programs. 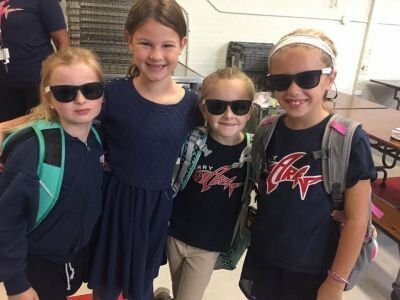 We coined the terms STEMomentum during the fall, and DeSTEMber as a time to celebrate and reflect on what had been accomplished during STEM month; we launched a new computer science class with grant funding; and now three-quarters of the Perry’s specialty teachers are STEM-based. But more important, it helped us to continue to chip away at that opportunity gap. It does that by giving our students learning experiences designed to enable access and agency. 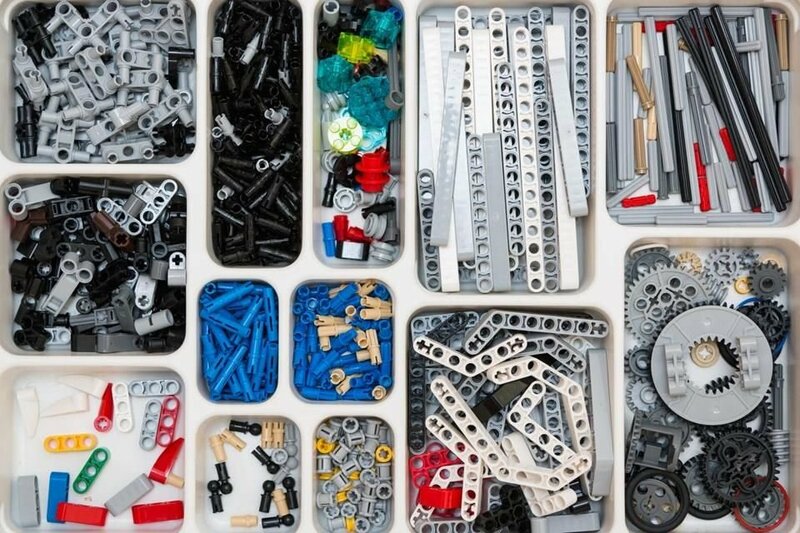 Students have access to materials, and they become their own agents to learn using those materials. 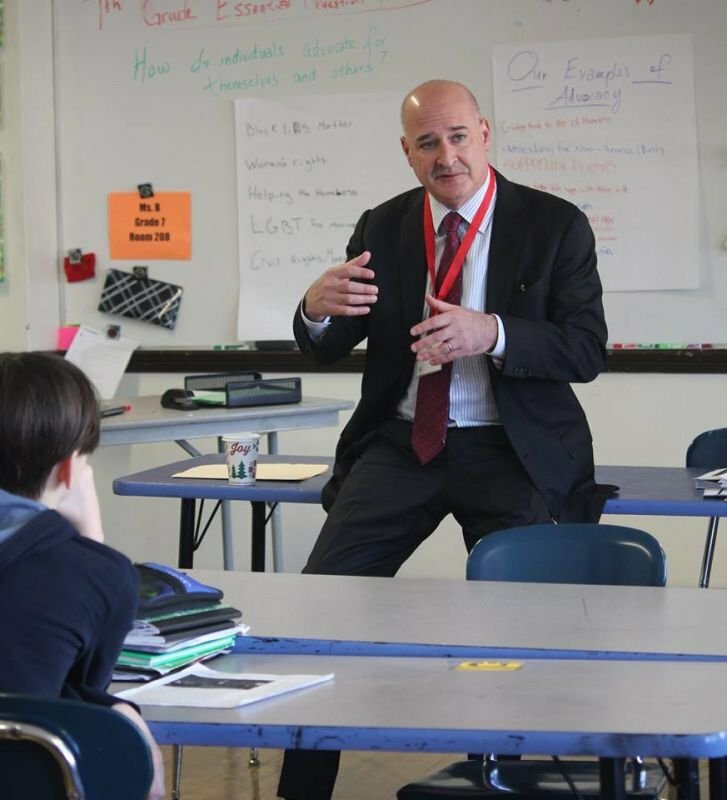 We at the Perry are big on social-emotional learning, and STEM is a great educational model to easily incorporate that for our students and for students across Massachusetts. Lands’ End Starboard Scholarship is open for students in Grades 6 and higher. The Perry K-8 School is one of only 23 Boston Public Schools to meet or exceed our school’s targets! - Meeting Targets. This is the designation for 23 BPS schools. - Partially Meeting Targets. This is the designation for 29 BPS schools. - Needing Focused/Targeted Support (requiring intervention.) This is the designation for 41 BPS schools. - Requiring Broad/Comprehensive Support (requiring intervention). This is the designation for nine BPS schools. To read the full story please use this link. Joel Latimer showed his science laboratory project to Superintendent Tommy Chang at the Oliver Hazard Perry School on Monday. The school is one of 36 in Boston focusing on science, technology, engineering, and math learning this week. Students at the Oliver Hazard Perry School are not following their typical middle school syllabus this week. Eighth-graders at the South Boston school spent Monday morning isolating their own DNA. Seventh-graders were creating light circuits. And sixth-graders were learning about Web design. “You’ll see a lump of DNA. There was a lot, like a lot, of DNA,” eight-grader Joel Latimer said, after explaining how to isolate the genetic material with Gatorade, ethanol, and soap. The Perry was among 36 Boston schools being transformed this week into learning labs focusing on science, technology, engineering, and math. 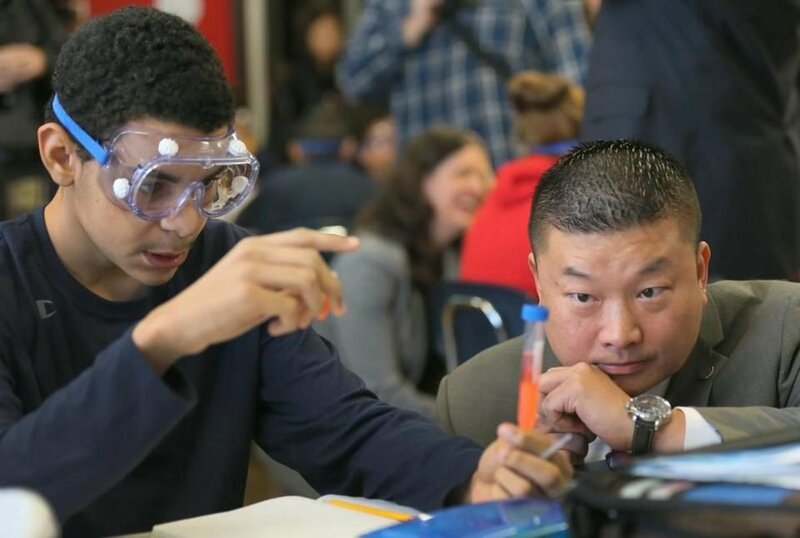 In all, 6,500 middle-school students in the city’s public schools are immersing themselves in STEM study, at a time of increased demand for proficiency on those fields in the working world. 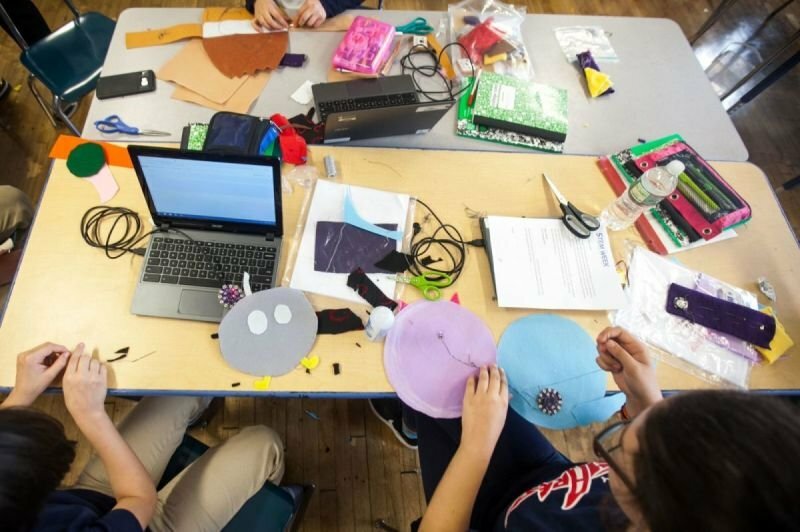 The program, developed by leading STEM organizations, including the Massachusetts Institute of Technology, i2 Learning, and MathWorks, focuses on hands-on activities so students can learn in a way they wouldn’t ordinarily experience in a classroom. 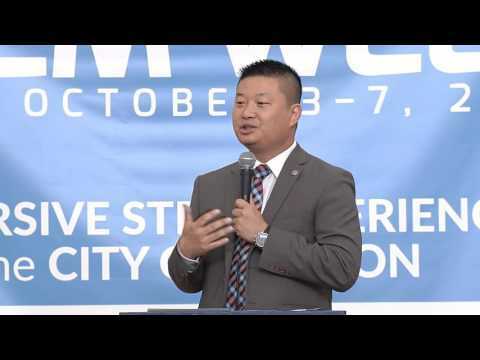 Mayor Martin J. Walsh and school Superintendent Tommy Chang,kicking off the week at the Perry, said embracing the class and others to follow can help them flourish in a rapidly changing world. He emphasized the importance of students knowing about science and technology by the time they graduate from middle school. Chang told Perry students that they need to be prepared to fill STEM jobs as they get older and finish school. At the Perry on Monday, students were working diligently to impress their teachers with their new projects and lesson plans. In Adam Kid’s seventh-grade class, students were creating two kinds of light circuits. 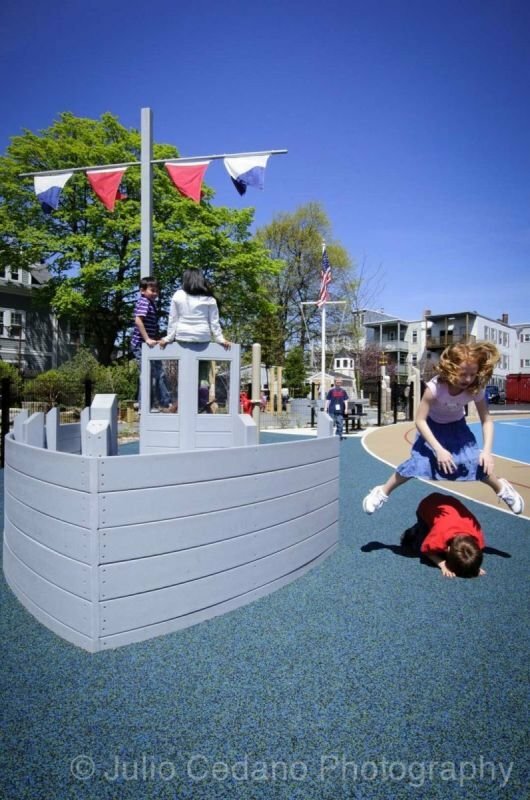 About 230 students (kindergarten through 8th grade) at the Oliver Hazard Perry School in South Boston spelled out One Boston in human form on their playground on Friday to mark the anniversary of the Boston Marathon bombings. 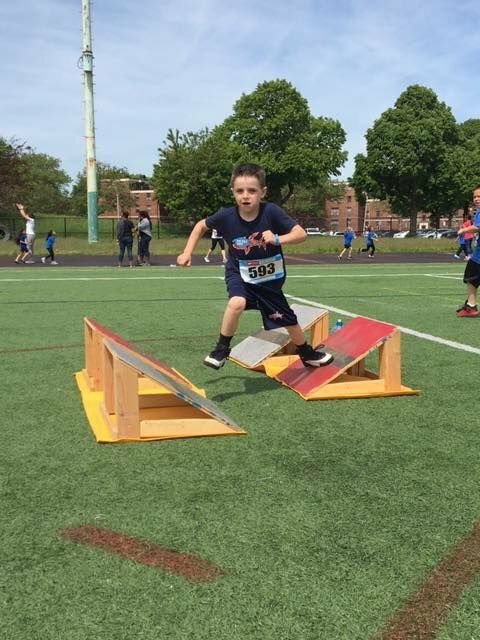 The Friends of the Perry School is a BPS approved 501(c)(3) charitable organization created to raise funds to financially support the Perry School. We aim to keep our fundraisers focused on our mission, which is to provide the best education for every child, every day, and to academically and socially advance our students through innovative experiences designed to positively promote the learning of the whole child. Please see the below dates/times for our Friends of the Perry meetings. **The Perry School After school program is available during the Friends of Perry Meeting for Perry students only on a complimentary basis. Please contact Bonnie to reserve your spot by 5pm on the Tuesday before the meeting at perrysmartsharks@gmail.com or 617-838-5079 to reserve your spot(s). If you would like to donate to the Perry School, please click on the "donate" tab and fill out the requested information. All donations to the Friends of the Perry School are 100% tax deductible and go directly to supporting our fantastic students and extraordinary teachers. If you have any questions or difficulty making your gift, please contact perryschoolsouthie@gmail.com. Alternative donation method: If you wish to make a donation to the Perry School via check, please send checks to the Perry School, c/o Friends of the Perry School, 745 East Seventh Street, South Boston, MA 02127. Matching Gift Program: This is an “easy” way to increase our fundraising efforts. Please contact your Human Resources Office to determine whether a charitable Matching Gift program exists at your company. If there is, please consider completing the required paper work that will enable them to match your generous donation. Yankee Candle Sales: Each year, students and families have the opportunity to buy and sell Yankee Candles to friends and family. A significant portion of Yankee Candle sale proceeds go to benefit The Perry School! 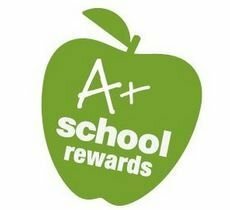 Stop and Shop A+ Rewards: You can sign up for Stop and Shop A+ rewards and support Perry School every time you use your Stop and Shop card (even when you shop Peapod) between September 7, 2018 and March 16, 2019! To support a school (up to two schools can be supported) you need your 13-digit Stop & Shop Card number found on the back of the card. 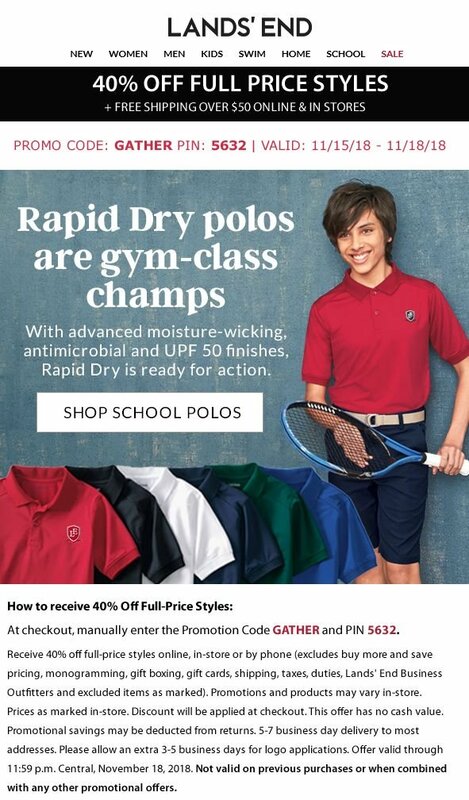 Visit www.stopandshop.com/school-rewards click on SIGN IN, MANAGE MY ACCOUNT, SAVINGS & REWARDS, to create or log into your on-line account. Shop AmazonSmile: AmazonSmile is operated by Amazon with the same products, prices, and shopping features as Amazon.com. The difference is that when you shop on AmazonSmile, the AmazonSmile Foundation will donate 0.5% of the purchase price of eligible products to The Friends of the Perry! Start shopping today at smile.amazon.com !! Mabel’s Labels Fundraiser: Clothing labels, name labels for lunch boxes and containers, allergy labels, medical labels, bag tags and more! Going to camp, preparing for next school year, whatever the reason- shop our fundraiser through Mabel’s Labels and 20% of your purchase will go to Friends of Perry! Labels are fully customizable and get shipped right to your home! Start shopping and be sure to select “Friends of the Perry School (South Boston)” from the list. 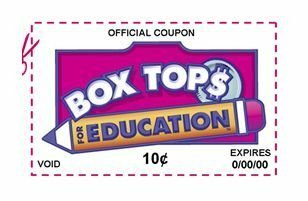 Box Tops for Education: Save your Box Tops! Any time you see a Box Top for Education (General Mills products, Kleenex, Pillsbury products…just to name a few places) cut it out and save it. Clip Box Top coupons from hundreds of grocery products and send them into school in your child's school folder. Annual Parents' Night Out: At the start of each school year, the Friends of the Perry School hosts a casual parents' night out for Perry School parents to get to know one another, catch up with friends, and support the Perry School. Friends & Family Skate Night: In January, the Perry School holds its Annual Friends & Family Skate Night at the Murphy Rink in South Boston. This event brings over 200 Perry School families and members of the South Boston community together for a fun evening of ice skating, raffles, prizes, food and refreshments. "Blades" from the Boston Bruins was also on hand to skate and take pictures. Spring "Perry School Rocks" Event: Every year, the Friends of the Perry School hosts the "Perry School Rocks" event to benefit the Perry School. This event features South Boston's own Thomas Park Band, silent auctions, raffles, drinks and dancing. All are welcome at this event to celebrate and benefit the Perry School. 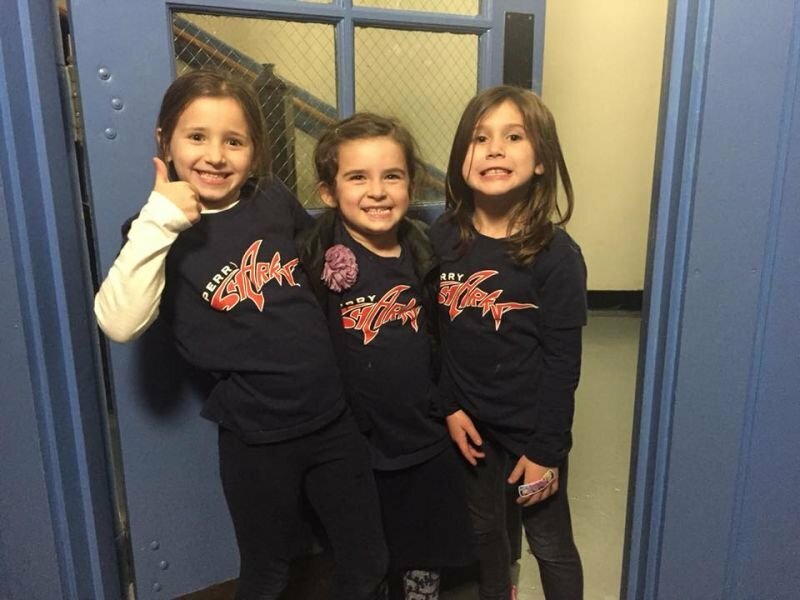 This year's "Perry School Rocks" fundraiser will be held on March 23, 2019 at the "Social Register" on D Street in South Boston . The Perry School community will be honoring Massachusetts State Senator Nick Collins for his support for the Perry School. Ticket information can be found on the "events" tab. 2017-2018 School Year Hours 9:30 a.m. - 4:10 p.m. Early Dismissal, the day before Thanksgiving and last two days of school: 2:10 p.m.